a putter swings through impact. What happens to the angle of your putterface after impact is academic. As long as it is square to your aimline at impact and a short distance beyond is all that really matters. It usually refers to how a putter swings to the inside after impact. It derives from the belief that the best putter path moves inside the aimline (target line) on the backstroke, is square at impact and then returns inside again on the through stroke. When you don't let your putter track back inside in its forward arc, you are supposedly not releasing your putter. But does this really matter? Surely the accuracy of any putt is largely determined by one thing – how square your putterface is to your aimline when your putter contacts the ball. He observed that there was a lack of stiffness in the left wrists of Mark O'Meara and Tiger Woods as their putter swung through the ball. From this he concluded that they were releasing the putter head through impact. And consequently that was why they got such a great roll on their putts. In evaluating this notion, consider for a moment the dynamics of the putterface and ball contact. The dwell time or contact duration of colliding objects is well understood by scientists. In golf the contact duration for a gentle tap-in is 0.85 milliseconds and slightly less for a 10-foot putt. After that brief moment in time, your ball is gone. What you do with your putter afterwards is less relevant because it is not going to influence your ball's path. However, to prevent any tendency for your putterface to close too soon prior to contact, I believe that you should focus on holding it square to your aimline for at less several inches beyond impact. In other words I favour an inside, square, square putter path. We know from the research of Dave Pelz in his Putting Bible that face angle errors at impact account for 83 per cent of misdirection. Therefore, far more important is what you do prior to impact in order to square your putterface. At this stage you can influence its orientation. Techno-terms like 'putter release' and 'toe flow' are the creation of golf coaches and putter manufacturers. Great putters in the past got by with less sophisticated imagery, and as long as they squared their blade to the aimline they chose, they improved their chances of holing the putt. 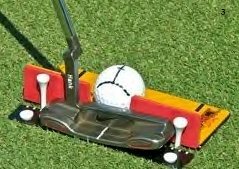 To my mind excellence in putting comes not from 'putter release' to the inside, but when you can pick the right line and then consistently deliver your putterface square to your aimline at the right speed.